81 mins. Rated R for language throughout, some violence, sexual content and drug use. Found footage will never really go away; there will just be good ones that surface in the pile of trash. Eduardo Sanchez (The Blair Witch Project, Lovely Molly) is quite well known for really creating the found-footage subgenre, or accidentally stumbling across it. He and Daniel Myrick proved that the concept can work, and then he tried some other stuff, and then went back for his next project: Exists. Sadly, this one didn’t stumble into greatness. It merely stumbled. 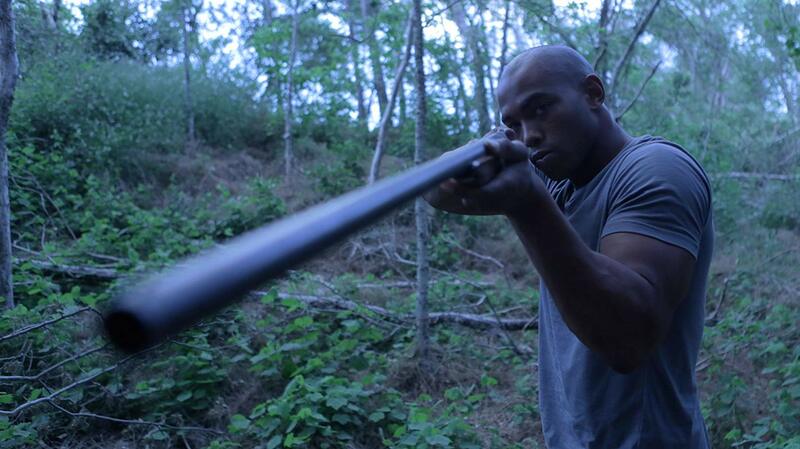 Five friends have set out on an outdoor adventure in east Texas. Brian (Chris Osborn, #REALITYHIGH, A Close Divide) and Matt (Samuel Davis, Last Flag Flying, Cabin Fever) have an uncle Bob with a cabin that they can stay at. When they hit something with the car, only to find nothing outside, the group ventures by foot to the cabin. The group enjoys their time at the cabin for the entire next day before finding themselves hunted by something. Something big. Something angry. Something out for revenge. 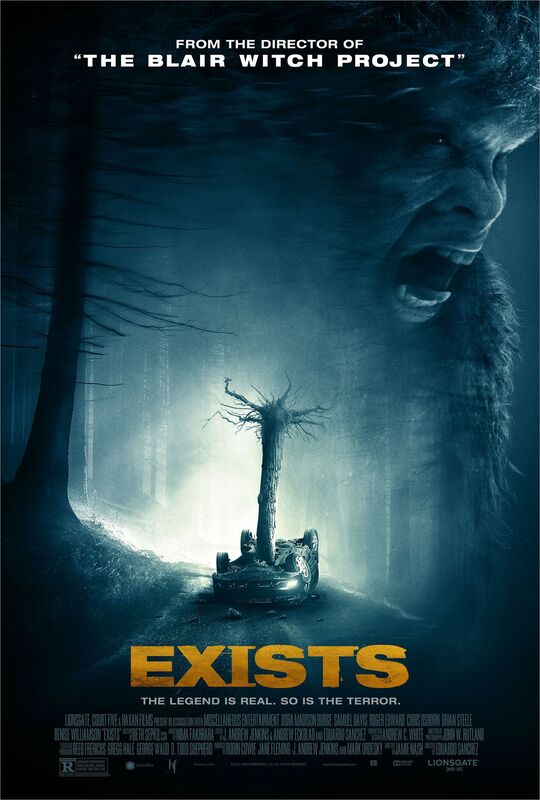 For a film that never hides the fact that it’s a movie about Bigfoot (Brian Steele, Terminator: Salvation, Anchorman 2: The Legend Continues), this film sure likes to keep Bigfoot at bay and hidden for most of the film. I mean, I get it, you are trying to do the Jaws thing and keep the monster hidden. So then why have it on the poster? Why get a terrific company like WETA to do your creature effects? Why do this and then deliberately obscure the creature. When filmmakers take use of shaky-cam, the creature comes off looking like a hairy dude in a suit. It only looked good when we finally see it on film. I found many of the characters in the film to be poorly written with no character development whatsoever. I didn’t know these characters. I wasn’t invested in them. I didn’t care if they lived or died. Now I definitely got more engaged in the film when the first half was done so that I could actually get to the meat of the story. The second half of Exists is still better than most of The Blair Witch Project. It just still isn’t very engaging. I just didn’t love Exists. To me, Sanchez just falls back on making the same movie here that he made before. And that first film wasn’t that good, and this isn’t good. Nothing is good about this. The creature design is amazing, and the film someone finds its footing far too late into its run time, but it just doesn’t have the chops to climb out of obscurity. For my review of Eduardo Sanchez and Daniel Myrick’s The Blair Witch Project, click here.